Yes, it's possible to keep the peace between turkey-eaters and Tofurky-eaters—no matter what you're up against! 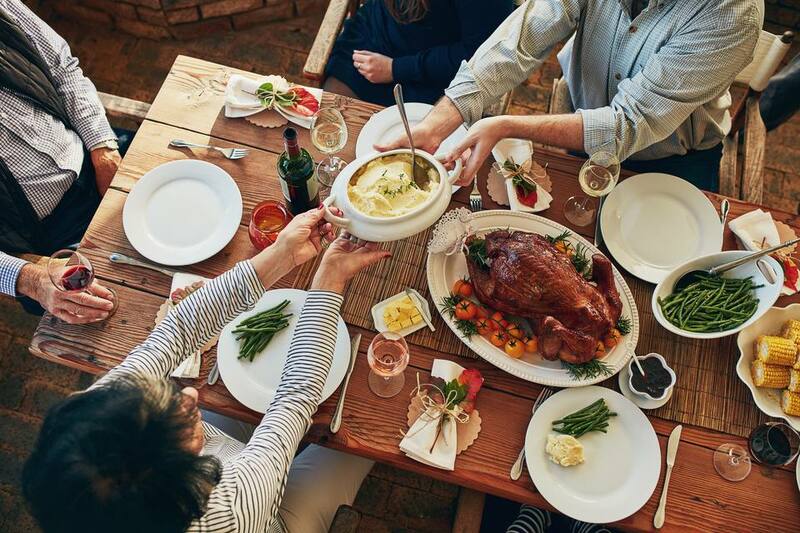 If you're a new vegetarian or worried that Aunt Sue won’t have a thing you can eat at her Thanksgiving table this year (and will insist that you eat it all anyways), here are two rules to help you be a great vegetarian guest and to ensure you will have a hearty Thanksgiving meal. This is the most important thing to remember at the holidays or when you are a guest of a non-vegetarian host. Let them know of your dietary needs well in advance and take responsibility on your own to ensure that your needs are met. You might offer to prepare a few vegetarian side dishes that everyone can enjoy, for example, or provide your host with some simple vegetarian Thanksgiving recipes. If you're preparing food for yourself, be sure to bring along a bit extra, as everyone else is certain to be curious and want to taste. Most hosts would be more than happy to have you help share in the work of preparing the meal. And, if you prepare a dish or two on your own, it will also fill your plate up and divert attention from what you're eating and not eating. Any vegan who has spent an entire meal defending their dietary choices and dodging hunting jokes knows that sometimes, you just want to eat in peace, rather than hop up on the vegan soapbox. But what if I can't cook? If you’ll be traveling or unable to cook for any reason, bring some pre-prepared foods that can easily be reheated. Tofurky makes a vegetarian gravy and many instant stuffing mixes are vegetarian or vegan. Whole Foods offers ready-made veggie Thanksgiving meals or side dish options and you can check with the local health food store or vegetarian restaurant to see if they have a similar service. Another idea is to buy vegetarian turkey deli slices, such as Tofurky’s cranberry deli slices. When warmed up for a few minutes in the microwave or oven, they are much like sliced turkey. Douse in vegetarian gravy and pile on the potatoes! Add a vegetarian stuffing and you've got yourself a meal. Tofurky deli slices are small, delicious and easy to pack up in a cooler. Depending on where you live, you may be able to order an entirely vegetarian or vegan Thanksgiving feast and have it delivered right to your door, no assembly required. Whole Foods offers a pre-cooked vegetarian Thanksgiving dinner, as do many larger health food stores and plenty of vegetarian restaurants such as Native Foods. You can also order vegetarian and vegan Thanksgiving side dishes a la carte from Whole Foods as well. If you want to do the cooking yourself, but need a little help, many Whole Foods stores offer vegetarian Thanksgiving cooking classes in the weeks before Thanksgiving. Remember, the holidays are about coming together with friends and family. After all, Thanksgiving is a meal that is really about the company and the experience, not the food. If you are having some difficulty with your menu plans, try thinking of a compromise, and don’t be afraid to get creative. If your host has prepared something that you are unable to eat, try to be as polite as possible about the situation and alleviate it the best you can. If there is nothing other than bread and cranberry sauce for you to eat, try to be quiet when you sneak out later for a veggie burger, rather than complaining loudly and announcing it when you leave. Be sure to have reasonable expectations. Your host may not be able to provide you with a five course gourmet vegan meal, but by communicating in advance and helping out, you aren’t likely to go hungry for the biggest meal of the year!